So what is going on at J. Hewit & Sons........? When I was a small boy, my father subscribed to a youth Magazine for me. After receiving all the copies for every year, he would bind them in volumes, which gave me endless pleasure for a long time after that. After having done leatherwork for a number of years, I became interested in binding all the old leather craft magazines I had accumulated. Before I could ask my father about his methods, he passed away. I then did extensive research, reading as much as I could, but also visiting bookbinders that still practice their craft by hand. Traditional bookbinders use their methods, developed over centuries, because it produces the desired product and "because it has always been done that way". I wanted something simpler, producing a stronger volume that could open completely for easy photocopying and I did not want to follow methods that required all sorts of weird tools. The method I developed and describe here, is completely my own and not traditional at all. It works best for binding magazines that consist of single (or multiple) signatures, i.e. the original magazine was produced by printing it on wide pages, folding them in half and stapling the pages together on the spine. 1. Assemble the magazines. Take out any contents that you do not want in there permanently, like the pattern pages in the Leather Crafter & SM Journal. Do NOT take out the staples that hold the pages together. Some people argue that this makes the spine of the eventual bound volume thicker. In my experience, not noticeably. Having the pages float all over while trying to stitch the signatures (magazines) together is much more difficult. 2. Place all the magazines in their proper sequence, i.e. Jan to Dec.
3. 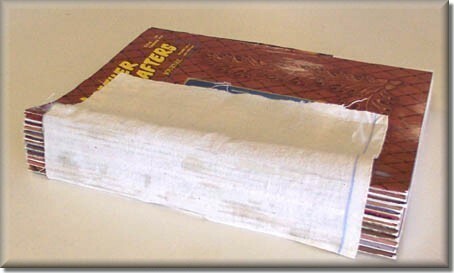 Take blank sheets of paper, double the size of the magazine, and fold them in half to form "blank magazines". One of these, consisting of two or three sheets of folded paper, is added in front, before the first magazine, and another is added to the back of the volume, after the last magazine. These serve to protect the magazines and as a place to paste in an index or table of contents of the articles. We will call these the blank signatures. 4. 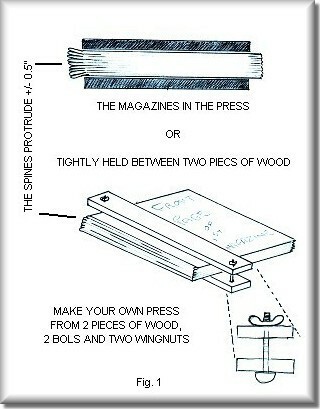 The magazines must now be "immobilized" or clamped in a bookbinding press as in fig.1 You can get away with just weighing down the magazines under heavy books, or you could use two long pieces of wood that you clamp over the magazines with pistol-grip clamps you can buy in any hardware store. Or the two pieces of wood can be firmly tightened with long brass bolts and wing nuts. All sides must be precisely squared up, as the magazines will now be "fixed" in their final positions within the volume. Be careful not to tighten the clamps or book press too much. As long as the Magazines cannot slide around, you have enough pressure on them. I have made the mistake of putting so much pressure on Photostatted (Xeroxed) newsletters that the print was transferred to the opposite page as well. With a book press it is not difficult to apply this much pressure. 5. 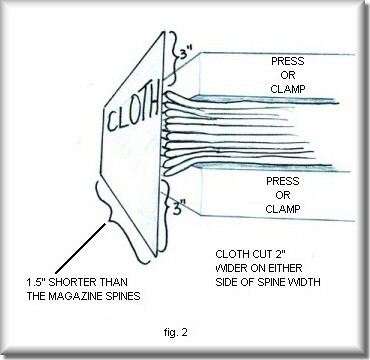 Measure the length of the spines of the magazines and cut a piece of cloth 1�" shorter than this. It must be wide enough to cover all the spines of all the magazines plus 3" to the front and back of the volume. 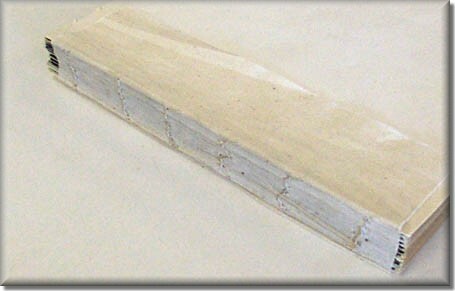 Here the cloth has been glued to the magazines and the whole volume can now be handled free of the press or clamp. I prefer to use unbleached linen, but you can also use the cloth from an old retired denim shirt - any cloth that will not stretch. 6. Put glue on the spines of the magazines. Cold white wood glue / project glue is fine and I believe Leather Weld should work very well. Quickly put the piece of cloth over the spines and make sure that it is glued to every magazine and to the blank signature that is in front and back of the volume. Leave it to dry, preferably overnight. This temporarily holds the magazines / signatures together while you stitch them to the cloth, but it does also serve to strengthen the final volume and give the spine a bit of rigidity. 7. When you take the volume out of the press, you will have all the signatures (magazines) glued to the cloth, with three inches of cloth lying on the top and at the bottom of the volume. Fig. 2 & 3 shows a cut-through view of the spine side of the volume. The thread used must not stretch and it must not be so thin that it cuts the paper easily while at the same time it must not be so thick that it adds too much bulk to the spines of the magazines. Have a look at the photograph above to see the thread I use. I draw the thread through a ball of beeswax once or twice to prevent it from knotting while I am sewing. 1. All the holes for the stitching is done from the inside of each individual magazine - from the exact centre spread, so that all the pages will be held by the stitches. Never open up a magazine completely. 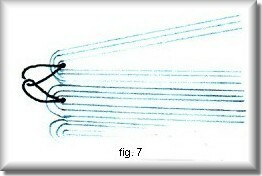 Keep it as shown in fig 4. Each hole that is made, is immediately used, in other words you do not make a whole row of holes and then attempt to find them all again to put the needle through. 2. 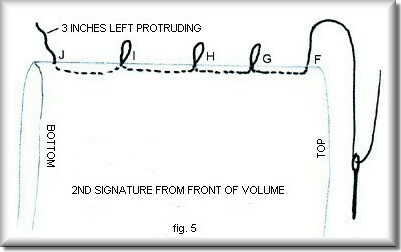 Fig 4 also shows how stitching is begun with the second signature, i.e. the first magazine after the blank signature. 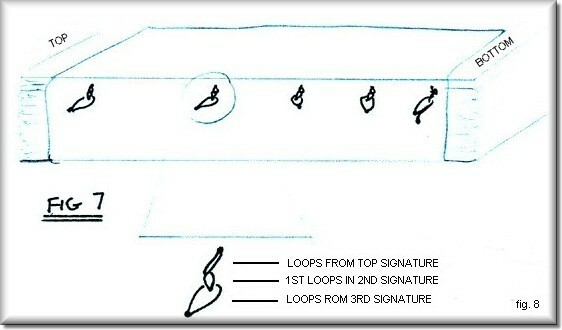 See also fig 5 where the blank signature is invisible and only the first magazine is shown. 3. 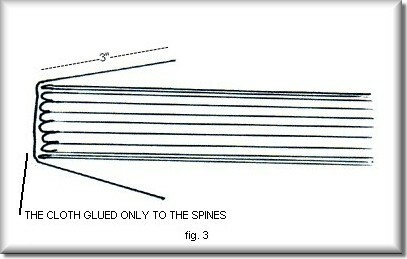 In fig 5 the thread is shown to go in and out of five holes. These correspond with the five holes shown in fig 6 as J, I, H, G and F, from magazine bottom to magazine top. 4. The first hole made, is # J. the thread is taken from the outside into the middle of the magazine and about 3" - 4" is left to protrude on the outside. 5. The thread is taken out at hole # I, looped around a Chinese Chopstick (not shown), and taken through the same hole back to the middle of the magazine again. The same looping is done at holes # H and # G.
6. At hole # F the thread is taken just to the outside. Open the first signature (the blank signature) in the middle, taking care not to shift the folded blank pages. Remember these will not have a staple through and can therefore move around. 7. Hole number E is now made in the first signature and the thread brought to the middle of the signature through that. 8. The thread is taken along the inside of the first signature to hole # D where it is taken to the outside, looped through the loop left there previously, dangling from hole # G and taken back through hole # D to the middle of the blank signature. The thread looping out of holes #D and # G will now give the cross section shown by fig 7. 9. Carefully pull on the thread now in the middle of the signature as well as on the loop coming from hole # H, so that the two loops have no slack on the outside and meet in the middle of the two holes as shown in the detail of fig 8. Take care not to pull the loop from hole # H in such a way as to pull the loop out of hole # I. 10. It is not necessary ever to have these holes in the same position in all the signatures. I prefer to have them a bit away from each other on purpose. When they are too close to each other, the thread tends to bite into the paper. So, if hole # E is 2" from the top of the magazines, hole # F can be 2.5" and hole # O can be 1.75 " or close to that. 11. The same procedure done with holes # D and # G is repeated at holes # C and # H as well as at # B and # I. 12. 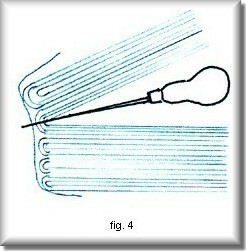 When the thread comes out of hole # J, a knot is tied with the 3" of thread left there in the beginning. 13. The thread is then taken into the middle of the third signature (the second magazine) through hole # K.
14. The thread is taken to the outside through hole # L, looped around the threads from holes # B and # I and is taken back inside through hole # L. This basic step is now repeated until all the signatures have been sewn. 15. When the thread comes out of the very last hole, it is tied to the other threads on the outside and cut off, about 4" from the knot. 16. The whole spine of the newly sewn volume is given a thin layer of glue, the Leather Weld type, and left to dry. The cloth has been sewn onto the magazines, forming a nice solid and secure spine. The flap of material seen on top of this volume will be sandwiched (and glued in place) between the outer cover of the volume and the stiffener or inner page of the volume. With the signatures now securely sewn together, the volume can now be set aside - it is quite sturdy and can even survive a trans-Atlantic crossing. If you are going to make a leather cover for it, this can be done at leisure. 1. There are no hard and fast rules about covering the volume. My father covered my youth magazines with cardboard box and brown paper and they outlasted my childhood. The covers look better than the insides. Here is my suggestion for the easiest leather cover. A lot of the basic techniques are left up to you. As always it will be a very good idea to try out every step on a test piece first. You can sew together a few folded blank pieces of paper and make a small note book to practice on. 2. Between the first blank signature and the 3" of cloth lying on top, I glue in a folded piece of decorated paper, using normal paper glue. This paper was traditionally marbled, but can be plain coloured or white. It is glued to both the cloth and the first blank signature page. The inside of this folded decorated paper will be what you see when you open the outer cover of the finished volume. 3. Optionally, on top of this decorated paper (on the outside), you can also include a stiffener. The always useful X-ray plates is one suggestion - any material goes, depending on how sturdy you want the volume to be. I like at least a thick cardboard. This is glued in under the cloth so that it is sandwiched between the cloth and the decorated paper. 4. To summarize: You will now have all the signatures in the middle, with a decorated page folded double on either side of the signatures. On the outside of these you will have an optional stiffener and folding over all of these, will be the cloth to which the magazines were sewn. Fig. 9. 5. Cut an decorate the outside leather cover as you would to cover a paperback book. I prefer to cut this cover in three pieces - Front, back, and the spine. That way you can utilize the original leather size better (you need a smaller original piece of leather to cut the three smaller pieces from). They can be sewn or laced together. As long as you end up with one single leather cover that can be glued to the volume. 6. Glue is applied to the whole outside of the volume, except the spine where the signatures were sewn to the cloth. This will never be glued to the leather cover - there will always be a gap along the spine of the volume between the cloth and the leather, allowing the volume to be opened up completely. 7. Weigh the volume down with other books or place it in a press again, being careful not to spoil the leather, and let the glue set and dry completely. You should now be able to pick up the volume only be the outside cover, which will consist of the leather, cloth, stiffener and one half of the decorative paper. The other half of the decorative paper is glued to the first page of the first blank signature, but unlike traditional bookbinding, this decorative page does not attach the cover to the volume - an inherent weakness in the traditional method. You should also be able to open up the volume at a chosen page and put it face down on a Xerox machine - completely flat. Of course, this depends also on the original binding method of the magazines. Johan Potgieter - Johan was born in South Africa. His dad bound youth magazines into volumes for him, based on instructions in the old British "Hobby" magazines. An early classic comic of the Elves and the shoemaker inspired Johan to start working with leather, which he did during student years in the late seventies. These two elements led to an interest in the binding of magazines in book form, with leather covers, of course. Johan is married and lives with his wife and two sons in Minnesota in the USA. He has a BSc. Biochemistry and Zoology degree and taught Computer Programming for more than ten years. He is currently a trainee store manager for a Tandy Leather store in Minneapolis. Johan can be contacted at leatherworker@gmail.com and you are welcome to visit his website: www.johan-potgieter.com to see some of his leather craft."